It’s fascinating to follow the discussion about the “Sanders revolution,” a vague phrase that lends itself to a variety of interpretations. Depending on your point of view, the term may be one of hope or derision. For others, it just provokes blank stares. The idea of a political revolution inspires those who can see that today’s Democratic Party is the captive of a system in which special interest money finances increasingly expensive campaigns. In the post-Citizens United era, these people recognize the historic significance of a candidate making a serious run for President without the backing of corporations or wealthy individuals, and despite the efforts of well-connected party leaders aghast that he is challenging one of their own. Beyond setting an example of how to beat this corrupt system, Sanders is out to change it. He is increasingly making campaign finance reform a centerpiece of his campaign. To many of his supporters, the “revolution” is defined as ending a system where the wealthy determine who are viable candidates to ostensibly represent us, while at the same time protecting their interests. Those who see the need to address the corrupting influence of money in politics find it hard to understand Democrats who can’t grasp why this prospect is causing such excitement. Party stalwarts are puzzled by the backlash against “the Establishment,” a term most Sanders supporters consider a euphemism for “corporatists.” In their frustration at what appears to be willful ignorance, they lash out at those who they should be trying to convince. Fortunately, Sanders’ popularity continues to increase with the exposure that the corporate media can no longer deny him. We will soon know if his momentum will continue to build fast enough to carry him past Super Tuesday. But even if it does not, the “revolution” must continue. While they have a valid argument, they offer no reasonable alternatives. Voting for either of the corporate-captured parties is a sham? To some extent that is true, but what do we do about it? Third parties are not viable, and given the state of leftist politics they will not become so before global climate change renders the point moot. Mass civil disobedience? In a country where the leading contender for the Presidency is the multimillionaire wife of a former President? Get real. The naivete of these arguments is matched only by the arrogance of those of their proponents who call Sanders supporters naïve. The smug self-assurance of these self-styled radicals masks a deep cynicism that prevents them from seeing how the Sanders campaign might actually aid their cause. Those who scorn the idea that he is the vanguard of a revolution in any meaningful sense of the term don’t seem willing to consider how his campaign can advance the cause of a more expansive transformation of the political system. In time-honored leftist tradition, they are busy forming a circular firing squad to attack the Sanders campaign from a position opposite that of Clinton backers who are also trying to shoot it down. Those critics who are serious about to build a movement for what they consider genuine revolution might want to consider the effect of dismissing millions of people who are at least aware of the need for a dramatic change. It is irrelevant that many may not fully comprehend what that means. It is impossible to create a mass movement if you expect everyone to agree with you. Differences are bound to arise and inflexibility causes schisms, destroying the solidarity on which any movement depends. It is elementary strategic thinking to consider how to work together where possible to achieve agreed upon objectives, even when there is disagreement on strategy or ultimate goals. How in the world can anyone expect a mass uprising of a population so steeped in the current system that half of those who consider themselves “progressive” would consider voting for a candidate backed by the finance industry, apparently believing her claims to be its sworn enemy? It is hard to see how anyone can argue with the idea that addressing the corrupting influence of money in politics is a good way to organize a movement. How many Americans would disagree with the notion that government doesn’t work because those in power put the interests of the 1% over those of the rest of us? The idea is so elementary that when Adbusters first wrote about Occupy, the idea of a constitutional amendment to reform campaign finance was the single action item they suggested. 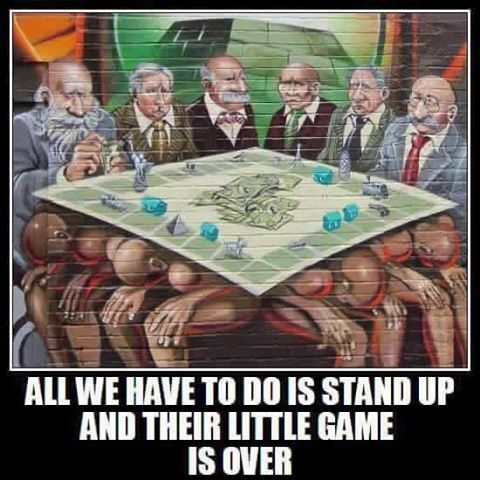 Occupying Wall Street symbolized that the ultimate power behind that money was the banking and finance industry that nearly destroyed the economy (or is in the process of doing so) and with it, the middle class (not to mention the poor). With a well-defined enemy and a clear objective, the movement had a chance to become much more than a symbolic protest, The problem was that Occupy activists refused to prioritize goals, making strategic political action impossible. Campaign finance reform is not the answer to all our problems, but it is the first step to finding one. If Sanders were to make this point clear, he might just convert a few skeptics. So far, he has focused on a promise to vet any candidates to the Supreme Court according to their willingness to overturn Citizens United. While laudable, Clinton has made the same promise. Despite the fact that this is yet another example of a promise to work on an issue she has avoided in the past and the fact that she depends on the system she now vows to destroy, her supporters trust her to keep it. That’s why Sanders should also be talking about his proposed constitutional amendment intended to end the doctrine that money spent to influence elections is protected speech. The key to using this to build a movement is that as President, he could promote the idea of voting only for candidates who would support such an amendment, as suggested by Move to Amend, as well as other reforms like the American Anti-Corruption Act. For those unfamiliar with the latter, it would address a variety of other ways that special interest money can influence politics, including putting limits on lobbying to include closing the revolving door (or at least significantly narrowing it). Keeping the need to address the corruption of the system in the forefront of American consciousness cannot but help the effort to get Americans to sustain pressure on Congress to put the needs of people over profit. The only way to advance any aspect of the progressive agenda is to first address the corruption that has created the problems in the first place. The Sanders “revolution” is just the first phase of the kind of fundamental change in American politics that can put us back on the path toward true representative democracy. How far we go will be up to us. SANDERS V CLINTON: REVOLUTION OR CIVIL WAR? It would have been amusing if the stakes weren’t so deadly serious: The New York Times described Clinton’s narrow victory in Nevada as reassuring “an anxious Democratic Party” that she could still win the nomination despite Sanders’ surging poll numbers. While not quite saying so, the implication seemed to be that the Democratic Party doesn’t include the insurgents who support Sanders. This is a subtle indication of the obvious: there is a civil war going on in the Democratic Party, and the corporate media has sided with the Democratic establishment. In order to end this civil war, Sanders supporters must convince Democrats leaning toward Clinton to join them in a revolution against corporate rule. While the candidates have confined themselves to occasional heated exchanges, most of the fighting has been going on in the alternative media, letters to the editor sections of newspapers, and social media. In the latter, the arguments are getting increasingly vicious. Sanders supporters are getting frustrated by what they see as the blindness of Clinton supporters to the need for "political revolution," whatever that means to them. While Sanders has never precisely defined the term, the context in which he refers to it suggests that it means creating a system where money does not determine who voters will get a chance to choose from to represent them. If we accept this as the definition of the term, then the question becomes one of whether the millions of Clinton admirers are willing to give up the dream of helping elect the first female President in order to pursue what many consider a quixotic quest: addressing the corrupting influence of money in politics. Is that really a naïve idea? Sanders supporters who expect more from his election than just populist rhetoric do not think so. Although he has not made the point clearly on the campaign trail, Sanders doesn’t just think that overturning Citizens United is just a good idea: He has been actively working on it for years. Furthermore, he has very specific ideas about how to do it. Not only would match Clinton’s promise to use a judge’s willingness to reverse the decision as a litmus test for Supreme Court appointment, he has already been attacking it with a more direct approach. Sanders has introduced resolutions for constitutional amendments to effect campaign finance reform in each of the last three Congresses, the most recent one just last month. 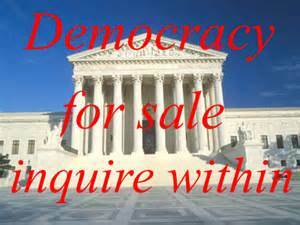 His strategy is not just overturn Citizens United, but the whole series of decisions that began when money used to influence political campaigns was declared protected “speech” in Buckley v Vallejo in 1976. Although the effort to pass a strong constitutional amendment has lost some momentum after the initial success of Move to Amend and other groups, the movement has not gone away. He could give it new life. As a senator, his ability to advance the idea was limited by how much attention his efforts received, including in the “alternative” media. Now that Sanders is highlighting campaign finance reform in front of a national audience, the issue could form the nucleus around which to build a real movement, one that could unite not only Democrats but all Americans. Regardless of political ideology, only the terminally naïve doubt that it is the corruption of politics by special interest money that has frustrated efforts to effectively deal with almost every problem whose solution might affect corporate profits. As President, Sanders would be in a position to lead the effort to pass an amendment, using the power of the movement that he has begun to mobilize. The theme of the Sanders campaign has been addressing corruption. He has returned again and again to the issue of the corrupting influence of money in politics, and particularly in elections. Although it was a point lost on most of her supporters, his pointing out in their last televised debate that Wall Street is a big Clinton backer was not an accusation of corruption. Deftly ignoring the distinction, she played for sympathy by accusing Sanders of “smearing” her. The problem is that it is not possible to “smear” someone by pointing out relevant facts. The sources of Clinton’s campaign funds are largely known, and she did not challenge the fact that she has accepted hundreds of thousands of dollars in speaking fees from Goldman Sachs alone. Sanders was too polite to mention that in total, she has received millions from Wall Street institutions and the industries in which they are most heavily invested (among these are the corporations that comprise the medical-industrial complex, raising questions about what makes her so sure that single payer will never come to the US even though it has been proven to work everywhere it has been tried around the world). As Sanders pointed out in frustration, it is hard to imagine why those who benefit from Washington’s corporate-centered policies would be throwing so much money at someone who calls herself their “greatest enemy” unless they understood that such threats are not to be taken seriously. 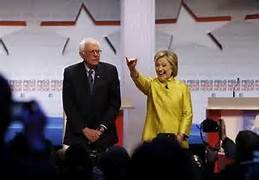 If Clinton is serious when she agrees with Sanders that Citizens United should be overturned, she should understand the importance of the fact that he is running without the benefit of SuperPAC backing or that of wealthy and well-connected establishment Democrats. It is important to remember that the Supreme Court decision to remove the floodgates of corporate cash was based on the assumption that it did not “create corruption or an appearance of corruption.” So if we were to take her objection seriously, shouldn’t we be concerned about at least the appearance of corruption when her campaign is primarily funded by wealthy donors and corporations? To repeat: pointing out that Clinton is very deeply enmeshed in a corrupt system is not the same as calling her corrupt. As she points out, so are almost all other politicians. Impugning her character on this basis is a sure way to encourage her admirers to defend her against more valid criticisms. A far more effective way to persuade them to back Sanders is to focus on the potential benefits of a Sanders win: It would prove that we don’t need to accept the candidates that the economic elite offer. As president, Sanders can take the lead in promoting reforms like the American Anti-Corruption Act and making a constitutional amendment a litmus test in every congressional election until we have a Congress that puts our interests over those of the billionaire backers of the current crop. That’s a pretty revolutionary idea. It’s dismaying to see Hillary Clinton still repeating the discredited idea that a single payer health care system would be too expensive. Although we already know it provides comprehensive and universal health care at a fraction of the cost of American’s non-system everywhere it has been tried, some of her supporters continue to find various justifications for opposing what polls show 85% of Democrats say they want. There has never been a better example of the self-defeating nature of establishment thinking in the Democratic Party. Attitudes about Clinton are so fixed that you have to wonder, if the primary were a referendum on single payer, would Democrats actually reject it? Of course, the election is about much more than that. Sanders has opened and closed the last two debates with well-honed arguments that taking on the corrupting influence of Wall Street would be his first priority. What he has not said in his comments about single payer is that concern for their Wall Street patrons was the reason Democrats took it off the table at the beginning of the health care reform debate in 2009. Their excuse was that it was “unrealistic.” Instead, they offered a bait-and-switch in the form of the Public Option. It was billed as a step to single payer because everyone would choose cheap, comprehensive Medicare-type over the spotty coverage of overpriced private insurance. However, Senator Schumer quickly ended that vain hope when he made a deal to handicap the Public Option so it could not compete with private insurance. Those who understand the economics of single payer know that the “reform” debate was primarily aimed at bailing out the Wall Street-owned medical insurance industry that was in the process of pricing itself out of existence. This is the “death spiral” of insurance costs: Increasing costs drive people from the market, requiring further increases to maintain shareholder profits and industry executive bonuses, resulting in more people unable to afford insurance. Unchecked, this would soon have led to a situation where average Americans would be paying 50% or more just for insurance premiums. Obviously, this is unsustainable. Enter corporate Democrats, with a “reform” that guarantees millions more customers for the insurance industry, subsidized by taxes that go directly into the pockets of Wall Street investors. Many rank-and-file Democrats failed to ask themselves what the suppression of the debate about single payer said about the chances of eventually electing a Democratic majority that would put the interests of people over profit. The answer is that the Democratic leadership, being dependent on Wall Street to control the White House, is insufficiently willing to challenge the corruption of the system. Until we find leaders in the party who will, there is no reason to expect anything to change. Reforming campaign finance would make achieving single payer and accomplishing the rest of the progressive agenda possible. The alternative is abandoning hope of getting what we need in exchange for what we can get, in the name of “pragmatism.” In using this as a selling point for her candidacy, Clinton is apparently arguing that truly representative democracy is a naïve notion. Elect her, she says, and she will use her experience navigating the existing corrupt system to fight for small, incremental victories that do not challenge the corporate takeover of American government and the economy. Clinton claims that her experience will enable her to guide us gradually in the general direction of where we need to go. It would be very interesting to hear how she plans to do this in the face of a hostile Congress that is likely to continue to be dominated by Republicans who have a visceral hatred for her. Would Democratic chances be any worse with a “socialist” who has explained that all he means by the term is someone who will fight for all Americans, rather than compromise principle on the altar of expediency? Sanders cannot pass single payer by himself, but neither can Clinton honestly promise to deliver any meaningful reforms of the Byzantine, unaffordable and woefully inadequate system of Obamacare. It will take a mass movement of Americans demanding their government put their interests over corporate profit to get real health care reform.